UFO pronounced as a word (“you-foh”) is a British television science fiction series created by Gerry “Thunderbirds” Anderson and Sylvia Anderson and produced by Century 21 Productions company. The Andersons had previously made a number of very successful marionette-based children’s science fiction series including Stingray, Thunderbirds, and Captain Scarlet. With silver space suits and space girls with purple hair in 1969 the series made interesting predictions about what life would end up like in the 1980s. I remember the Car telephones and mobiles as well as the use of computers in day-to-day life, electronic fingerprint scanning and identification against a database. 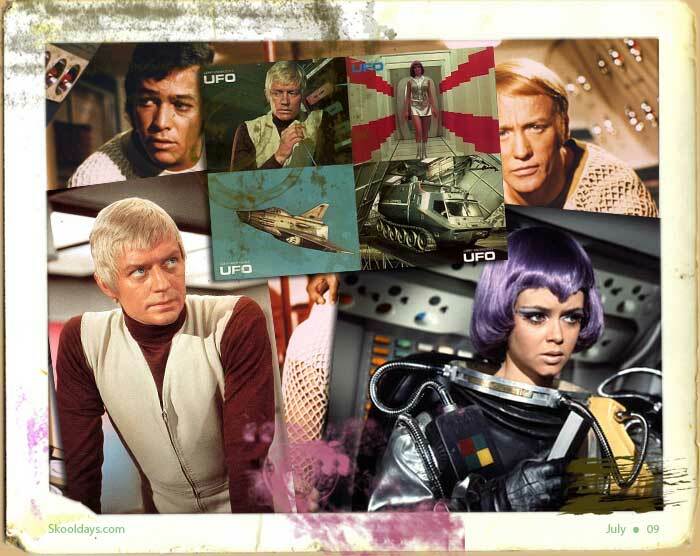 UFO had 26 episodes, including the pilot, were filmed over the course of more than a year, with a five-month production break caused by the ultimate closure of the MGM-British Studios in Borehamwood, where the show was initially made. There was promise of a second season of UFO. Unwilling to let the UFO 2 pre-production work go to waste, Anderson instead offered ITC a new series idea, unrelated to UFO, in which the Moon would be blown out of Earth orbit taking the Moonbase survivors with it. This proposal developed into Space: 1999. When Space:1999 was broadcast there was no trace in its plot of the show which had been its precursor. Anyone else remember the bubblegum cards and dinky models that came as a commercial spin off from the above. Even Jigsaws by Arrow and board games followed, but that’s another blog for another day. This entry was posted in PrimeTime and tagged 1960, 1970, 1980 by Skooldays. Bookmark the permalink. I was hooked on Space:1999! !